Home » Politics » Meet Mehbooba Mufti, the likely new Chief Minister of J&K. Cold sweat, BJP? Meet Mehbooba Mufti, the likely new Chief Minister of J&K. Cold sweat, BJP? As Jammu & Kashmir's Chief Minister, Mufti Mohammad Sayeed has just passed away, this assessment of Mehbooba Mufti, published earlier in Catch comes back into sharp focus. In 1999, when 151 people signed a "vision document" to found the PDP, few people took note. That the party was led by Mufti Mohammad Sayeed was reason enough to ignore it. Though a former home minister of India, Mufti enjoyed little popularity in the valley. For most people, bred in a separatist narrative, he represented New Delhi in Kashmir. But within just three years, the PDP was leading the state's first elected non-National Conference government since 1975. In the 2002 assembly polls, the party won 16 seats, enabling it to form a coalition with the Congress. Mufti became chief minister for the first half of the government's six-year term and Ghulam Nabi Azad the latter. What turned a party born in obscurity into a vaunted political force almost overnight? 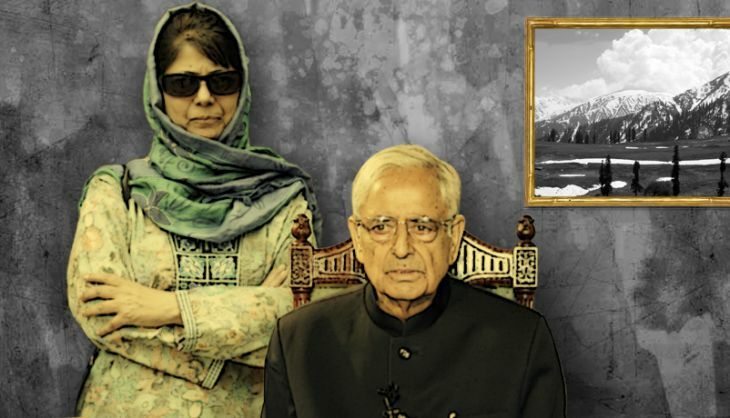 It was Mufti's daughter Mehbooba Mufti, who is now touted to take over as the chief minister. At a time when politicians were afraid to move freely even in the secure pockets of Srinagar, Mehbooba travelled to the interiors of the valley, where militancy was still raging, to connect with people. She even visited families of militants and separatist activists. In 1999, she went to the home of the then Hizb-ul-Mujahideen Operations Chief Aamir Khan whose teenage son, Abdul Hameed, had allegedly been killed in custody by the security forces. This outreach enabled her to tap into the valley's vast separatist political space, and forge the PDP into a mainstream alternative to the secessionist outfits which stay out of electoral politics. The strategy paid off. Mehbooba was successful in enlisting the electoral support of the valley's separatist constituency, particularly the cadre of the Jamaat-i-Islami - even covert help from the Hizb, some say - to plug the PDP deep into Kashmir's political soil. In the 16 years since, the PDP has grown into a formidable political and electoral machine. It has gone from 16 seats in 2002 to 21 in 2008 to now the single largest party with 28 seats. In this time, Mehbooba has twice been elected to the parliament and the assembly but has never occupied a government post, preferring to work in the shadow of her father. So far, she has only held the reigns of the party, letting her father govern when the PDP was in power. Mufti, however, has been invaluable in keeping the party together, his seniority and political stature commanding everybody's respect. But the patriarch no longer keeps good health, and Mehbooba was the first to spill the beans. Addressing party workers on 18 August, she broke down while talking about her father's poor health. "He is not in the best of health. He has sent greetings to all of you," she said, struggling to regain her composure. "Please pray for his long life". At the time, Mufti was outside the state, apparently for a medical check-up. He returned after nine days. The long absence in the midst of the dramatic resignation of the then Chief Secretary Iqbal Khandey set tongues wagging. Mufti temporarily put the buzz to rest when he returned on 29 August and rushed to the secretariat to meet some ministers, legislators and visitors, and clear files. He went home in the early afternoon, where he met the NABARD chairman Harsh Kumar Bhanwala in the evening. The buzz has returned in recent weeks, and is getting louder by the day. And this time, it has been fanned by Mufti himself. Talking to the media in Jammu recently, he said, in reply to a question, that Mehbooba deserved to be chief minister. "It's a democratic process. Mehbooba has been working in the field as party president. She has represented an assembly constituency and now represents a seat in the Lok Sabha," Mufti said. "She deserves this." So, it's no longer a matter of whether Mehbooba will take over, but when. At least from the PDP's point of view. But what could be the fallout of her succession? On her party, the PDP-BJP coalition and the larger politics of the state. In a sign that the BJP is not yet on board on Mehbooba's proposed takeover, senior party leader Avinash Rai Khanna recently ruled out any transition of power. "There is no truth in the rumours that change of guard is on the cards in Jammu and Kashmir," Khanna, who is the BJP's chief whip in Rajya Sabha, said. "The coalition government is running smoothly. No such meeting or communication has taken place between Mufti and the BJP high command". Still, Mehbooba's elevation to the top job is inevitable. What happens then? It's no secret that her perceived political and ideological leanings have been a source of unease in New Delhi. Former RAW chief Amarjit Singh Dulat recounts in his memoir, Kashmir: The Vajpayee Years, that the Atal Bihari Vajpayee government suspected Mehbooba of having links with the Hizb and even accepting the militant group's help during the 2002 election. So, when Vajpayee visited Kashmir in 2003, he refused to share the stage with Mehbooba, the chief of the state's ruling party. Mehbooba can also cause heartburn within her own party, which boasts of several leaders with an individual political standing and constituency. Indeed, two of them, former deputy chief minister Muzaffar Hussain Beigh and former finance minister Tariq Hameed Karra, both MPs, are currently at loggerheads with the party. While Beigh has spoken out against the functioning of the state government and the PDP, Karra has slammed the party for aligning with the BJP. In doing so, they have tried to tap a sense of growing exasperation in the valley about the functioning of the coalition regime. Mehbooba could anticipate opposition from Mufti's loyalists as well. They are the leaders who are close to Mufti but do not sharing the same rapport with her, and they would like to delay the transition. This raises fears about the unity of the post-Mufti PDP. However, the overriding factor in Mehbooba's favour is that Mufti himself will usher her into the job. And with him still watching from the background, any potential detractor will find the going tough. The real challenge for Mehbooba, therefore, will be how effectively she straddles the antagonistic ideological worlds of the PDP and the BJP. Any marked lurch towards either side is certain to have grave implications for her and her party.